Dave's Recipe Book Project has a change of name but still challenges us to produce a photo using only apps, iPhone or Android. My entry is very simple, starting with a photo taken late at night at my big birthday bash. 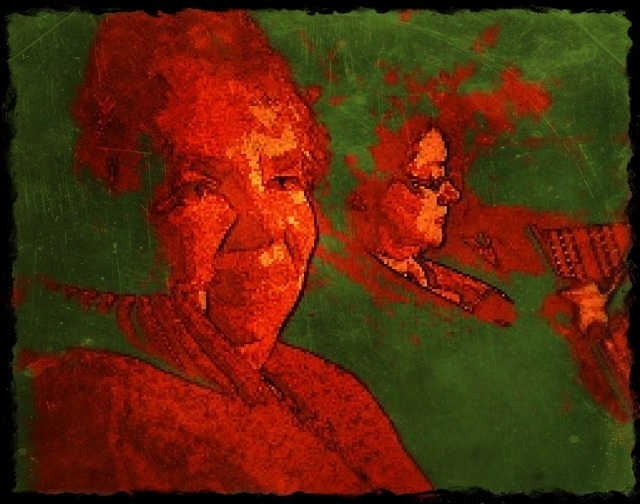 A friend was exploring PaperCamera on my iPhone, and snapped me and my friend Samantha as we sat by the open fire. The PaperCamera mode was Andy Pop, which produces 4 images in an Andy Warhol style. I opened this in PhotoToaster and cropped to one image only and saved. A strange choice, perhaps. I opened this again in PhotoToaster and in Lighting I chose Recover Hilights, in Fx I chose Sharpen, in Vignette I chose Deep Focus, in Texture I chose Antique, and finished with the Border. Black Brush. Then saved. Terrific, Carol! Happy Birthday greetings too - looks like you had fun? This is great!!! You know...I've never thought about cropping out a panel when I use a Warhol effect...I like that idea!! Thanks so much for joining in...this is a super image and recipe!! Haha so clever! Love the complimentary colors!!!! Ronnie, thank you. Did you recognise Samantha in the other half of the photo? Gill, thank you for the birthday greetings. We certainly did have a lot of fun. Dave, I love the Warhol effect, nothing subtle about it, is there? Jae, thanks, I love the colours too. So cool, Carol! I'm finally getting time to look at your blog :) Hope you had a wonderful birthday.